HomeClick here to return to the home page of Carettochelys.com! LinksA collection of turtle sites which have valuable and relevant information! ContactHow to contact Jan Matiaska and Scott Thomson! NomenclatureDetailed information on the correct names of Australian Turtles! LiteratureLinks to web publications that will help you to improve your turtle knowledge and husbandry! AuthorsShort Biographies on the Authors of Carettochelys.com! Guest MapPlease put a pin our Guest Map, it lets us know your thoughts and where you are from when you make comments! Like other members of the Chelodina genus, Chelodina oblonga is carnivorous feeding on aquatic insects, small fish, shrimp, yabbies, tadpoles and frogs. (Cann, 1998). Carrion is also eaten. There are about 55 inland fishes while the macro-invertebrate fauna of inland waters of the south-west consists of 250-300 taxa (Lane et al., 2001). In captivity, hatchlings feed on mosquito larvae, water fleas (Daphnia) and fish. (McCutcheon, 1985) Young turtles may also eat aquatic plants (McCutcheon, 1985). 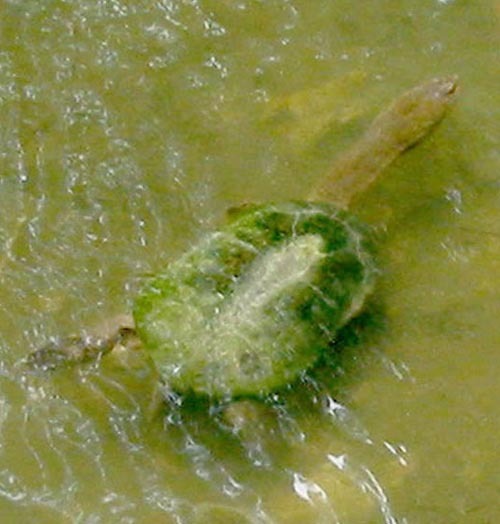 The species is able to catch live prey as it has the fastest strike out of all true Chelodina species. (Thomson, 2004, pers. comm.) Even though the species' body temperature was observed to vary between 18°C and 31.0°C (Clay, 1981), it is recommended to keep the species in water with the temperature of 22-23°C in order to maintain optimal consumption and assimilation rates. Like many other Chelids, C. oblonga may increase its rate of digestion by maintaining high body temperature through aquatic basking in the warm top layer of the water. Apart from aquatic basking, the species has been observed basking out of the water as well, resting on woody debris that protrudes from the water surface. Mating occurs in winter and spring (the southern hemisphere time). According to Kuchling (1988) males sexually mature at the carapace length of 140mm while females mature at the length of 160-170mm. Eggs size varies from 30x18mm to 35x22mm while the weight can be anywhere between 6.5 and 11.5g. The mean length and weight of hatchlings is 31mm and 9.5g respectively. (Kuchling, 1988, 1989) The incubation period lasts from 200 to 230 days under natural conditions (Kuchling, 1988, 1989), but McCutcheon (1985) claims it took 291 days to hatch for eggs in a natural nest. Strategies which have been implemented as a result of the previous management plan include the construction of ramps on the roadside kerbs and the erection of signs to warn drivers of the presence of turtles (Fox et al., 2004), however little success was achieved. A study by Giles (2001) suggested several methods of reducing turtle deaths but these proposals have failed to be transferred into reality. Beside road deaths and predation, another threat can be seen in severely reducing natural habitat due to the draining or filling of their swamps for agriculture.